The term Biblical canon refers to a definitive list of inspired, authoritative books that "constitute the recognized and accepted body of sacred scripture" found in the religions of Judaism and Christianity. These lists of authoritative scriptures emerged through a prolonged period of debate among religious authorities. The final list of accepted scriptures is often considered to be inspired by God. Nevertheless, differences still exist between the Jewish and Christian canons, as well as between the canons of different Christian denominations. Books excluded from a particular canon are considered non-canonical although some biblical texts (see Apocrypha or Deuterocanonical) have quasi canonical status. The Masoretic Text is the canonical text for Judaism, and for many Protestants, the King James Version is the canonical text. According to Eugene Ulrich, "the current use of the term "canon" to refer to a collection of scripture books was introduced by David Ruhnken in 1768 in his Historia critica oratorum graecorum for lists of sacred scriptures. While it is tempting to think that such usage has its origins in antiquity in reference to a closed collection of scriptures, such is not the case." The technical discussion includes Athanasius's use of "kanonizomenon=canonized" and Eusebius's use of kanon and "endiathekous biblous=encovenanted books"
A canonic text is a single authoritative edition for a given work. The establishing of a canonic text may involve an editorial selection from biblical manuscript traditions with varying interdependence. Significant separate manuscript traditions in the Hebrew Bible are represented in the Septuagint, the Targums and Peshitta, the Samaritan Pentateuch, the Masoretic Text, and the Dead Sea scrolls. New Testament Greek and Latin texts presented enough significant differences that a manuscript tradition arose of presenting diglot texts, with Greek and Latin on facing pages. New Testament manuscript traditions include the Codex Vaticanus, Codex Sinaiticus, Codex Bezae, Codex Alexandrinus, Textus Receptus, Vetus Latina, Vulgate, and others. Usually the biblical canons are' considered to be closed (i.e., books cannot be added or removed). By contrast, an open canon would allow additional books, should they meet the criteria — but, effectively, this is the same as no canon at all or only a canonical process but not yet a canon of scripture. The closure of the canon reflects a belief that public revelation has ended and thus the inspired texts may be gathered into a complete and authoritative canon. Rabbinic Judaism recognizes the 24 books of the Masoretic Text, commonly called the Tanakh or Hebrew Bible. Evidence suggests that the process of canonization occurred between 200 B.C.E. and 200 C.E., indeed a popular position is that the Torah was canonized ca. 400 B.C.E., the Prophets circa 200 B.C.E., and the Writings ca. 100 C.E. perhaps at a hypothetical Council of Jamnia—however this position is increasingly criticized by modern scholars. The book of Deuteronomy includes a prohibition against adding or subtracting (4:2, 12:32) which might apply to the book itself (i.e. a closed book, a prohibition against future scribal editing) or to the instruction received by Moses on Mount Sinai. The book of 2 Maccabees, itself not a part of the Jewish canon, describes Nehemiah (around 400 B.C.E.) as having "founded a library and collected books about the kings and prophets, and the writings of David, and letters of kings about votive offerings" (2:13-15). The Book of Nehemiah suggests that the priest-scribe Ezra brought the Torah back from Babylon to Jerusalem and the Second Temple (8-9) around the same time period. Both I and II Maccabees suggest that Judas Maccabeus (around 167 B.C.E.) likewise collected sacred books (3:42-50, 2:13-15, 15:6-9), indeed some scholars argue that the Jewish canon was fixed by the Hasmonean dynasty. However, these primary sources do not suggest that the canon was at that time closed; moreover, it is not clear that these sacred books were identical to those that later became part of the canon. Today, there is no scholarly consensus as to when the Jewish canon was set. A Samaritan Pentateuch exists providing another version of the Torah in the Samaritan alphabet. The relationship to the Masoretic Text and the Septuagint is still disputed. Fragments among the Dead Sea scrolls have been identified as proto-Samaritan Pentateuch text-type. The Samaritans accept the Torah but do not accept any other parts of the Bible, probably a position also held by the Sadducees. Moreover, they did not expand their Pentateuchal canon even by adding any Samaritan compositions. The small community of the remnants of the Samaritans in Palestine includes their version of the Torah in their canon. The Biblical canon is the set of books that Christians regard as divinely inspired and thus constituting the Christian Bible. Though the Early Church used the Old Testament according to the canon of the Septuagint (LXX), the apostles did not otherwise leave a defined set of new scriptures; instead the New Testament developed over time. 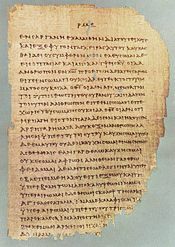 A folio from Papyrus 46, an early 3rd century collection of Pauline epistles. The writings attributed to the apostles circulated amongst the earliest Christian communities. The Pauline epistles were circulating in collected form by the end of the first century C.E. Justin Martyr, in the early second century, mentions the "memoirs of the apostles," which Christians called "gospels" and which were regarded as on par with the Old Testament. A four gospel canon (the Tetramorph) was in place by the time of Irenaeus, c. 160, who refers to it directly. By the early 200s, Origen may have been using the same 27 books as in the modern New Testament, though there were still disputes over the canonicity of Hebrews, James, II Peter, II and III John, and Revelation. Likewise, by 200 C.E., the Muratorian fragment shows that there existed a set of Christian writings somewhat similar to what is now the New Testament, which included the four gospels and argued against objections to them. Thus, while there was a good measure of debate in the Early Church over the New Testament canon, there were also precedents for the current canon dating back to the second century. The canonical Christian Bible was formally established by Bishop Cyril of Jerusalem in 350 C.E., confirmed by the Council of Laodicea in 363 C.E., and later established by Athanasius of Alexandria in 367 C.E. In his Easter letter of 367 C.E., Athanasius, Bishop of Alexandria, gave a list of exactly the same books as what would become the New Testament canon, and he used the word "canonized" (kanonizomena) in regards to them. The African Synod of Hippo, in 393 C.E., approved the New Testament, as it stands today, together with the Septuagint books, a decision that was repeated by Councils of Carthage in 397 C.E. and 419 C.E. These councils were under the authority of Augustine of Hippo, who regarded the canon as already closed. Pope Damasus I's Council of Rome in 382 C.E., if the Decretum Gelasianum is correctly associated with it, issued a biblical canon identical to that mentioned above, or if not the list is at least a sixth century compilation. Likewise, Damasus's commissioning of the Latin Vulgate edition of the Bible, c. 383, was instrumental in the fixation of the canon in the West. In 405, Pope Innocent I sent a list of the sacred books to a Gallic bishop, Exsuperius of Toulouse. When these bishops and councils spoke on the matter, however, they were not defining something new, but instead "were ratifying what had already become the mind of the Church." Thus, from the fourth century, there existed unanimity in the West concerning the New Testament canon (as it is today), and by the fifth century the East, Eastern Orthodoxy with a few exceptions, had come to accept the Book of Revelation and thus had come into harmony on the matter of the canon. Nonetheless, a full dogmatic articulation of the canon was not made until the Council of Trent of 1546 for Roman Catholicism, the Thirty-Nine Articles of 1563 for the Church of England, the Westminster Confession of Faith of 1647 for Calvinism, and the Synod of Jerusalem of 1672 for the Greek Orthodox. Many Evangelical Christian groups do not accept the theory that the Christian Bible was not known until various local and Ecumenical Councils, which they deem to be "Roman-dominated," made their official declarations. Accordingly when I went East and came to the place where these things were preached and done, I learned accurately the books of the Old Testament, and send them to thee as written below. Their names are as follows: Of Moses, five books: Genesis, Exodus, Numbers, Leviticus, Deuteronomy; Jesus Nave, Judges, Ruth; of Kings, four books; of Chronicles, two; the Psalms of David, the Proverbs of Solomon, Book of Wisdom also, Ecclesiastes, Song of Songs, Job; of Prophets, Isaiah, Jeremiah; of the twelve prophets, one book ; Daniel, Ezekiel, Book of Esdras. From which also I have made the extracts, dividing them into six books. Apostolic Origin—attributed to and based on the preaching/teaching of the first-generation apostles (or their close companions). Universal Acceptance—acknowledged by all major Christian communities in the ancient world (by the end of the fourth century). Liturgical Use—read publicly when early Christian communities gathered for the Lord's Supper (their weekly worship services). Consistent Message—containing a theological outlook similar or complementary to other accepted Christian writings. The basic factor for recognizing a book's canonicity for the New Testament was divine inspiration, and the chief test for this was apostolicity. The term apostolic as used for the test of canonicity does not necessarily mean apostolic authorship or derivation, but rather apostolic authority. Apostolic authority is never detached from the authority of the Lord. ↑ Athanasius Letter 39.6.3: "Let no man add to these, neither let him take ought from these." Christian Classics Ethereal Library. Retrieved December 3, 2008. ↑ McDonald & Sanders, 32-33: Closed list; 30: "But it is necessary to keep in mind Bruce Metzger's distinction between "a collection of authoritative books" and "an authoritative collection of books." "
↑ Philip R. Davies, "The Jewish Scriptural Canon in Cultural Perspective," 50: "With many other scholars, I conclude that the fixing of a canonical list was almost certainly the achievement of the Hasmonean dynasty." in McDonald & Sanders, Chapter 3. ↑ James C. VanderKam, "Questions of Canon through the Dead Sea Scrolls," 94, in The Canon Debate, McDonald & Sanders, (eds), chapter 6: citing private communication with Emanuel Tov on "biblical manuscripts": Qumran scribe type c. 25 percent, proto-Masoretic Text c. 40 percent, pre-Samaritan texts c. 5 percent, texts close to the Hebrew model for the Septuagint c. 5 percent and nonaligned c. 25 percent. ↑ Jewish Encyclopedia: Sadducees: "With the destruction of the Temple and the state the Sadducees as a party no longer had an object for which to live. They disappear from history, though their views are partly maintained and echoed by the Samaritans, with whom they are frequently identified (see Hippolytus, "Refutatio Hæresium," ix. 29; Epiphanius, l.c. xiv. ; and other Church Fathers, who ascribe to the Sadducees the rejection of the Prophets and the Hagiographa; comp. also Sanh. 90b, where "Ẓadduḳim" stands for "Kutim" [Samaritans]; Sifre, Num. 112; Geiger, l.c. pp. 128-129), and by the Karaites (see Maimonides, commentary on Ab. i. 3; Geiger, "Gesammelte Schriften," iii. 283-321; also Anan ben David; Karaites)." ↑ "Samaritan Version of the Pentateuch".Jewish Encyclopedia. Retrieved December 3, 2008. ↑ McDonald & Sanders, 259: "the so-called Septuagint was not in itself formally closed." — attributed to Albert Sundberg's 1964 Harvard dissertation. ↑ The Cambridge History of the Bible (volume 1) eds. P. R. Ackroyd and C. F. Evans (Cambridge University Press, 1970), 305; cf. the Catholic Encyclopedia, Canon of the New Testamentnewadvent.org. Retrieved December 3, 2008. ↑ Catholic Encyclopedia, Canon of the New Testament.newadvent.org. Retrieved December 3, 2008. ↑ Fathers, New Advent.org. Retrieved December 3, 2008. Beckwith, Roger T. Old Testament Canon of the New Testament Church and Its Background in Early Judaism. Grand Rapids, MI: Eerdmans Pub. Co. 1986. ISBN 978-0802836175. Blenkinsopp, Joseph, "The Formation of the Hebrew Canon: Isaiah as a Test Case." in The Canon Debate, edited by Lee Martin McDonald and James A. Sanders. Hendrickson Publishers, 2002. Brakke, David. "Canon formation and social conflict in fourth century Egypt," in Harvard Theological Review 87(4) (1994): 395–419. Athanasius' role in the formation of the N.T. canon. Bruce, F. F., Canon of Scripture. InterVarsity Press, (1988) 1992. ISBN 978-0830812585. The Cambridge History of the Bible, (volume 1) eds. P. R. Ackroyd and C. F. Evans. Cambridge University Press, 1970. Davies, Philip R. "The Jewish Scriptural Canon in Cultural Perspective," 50, in The Canon Debate, edited by McDonald and Sanders. Davis, L. D. First Seven Ecumenical Councils (325-787): Their History and Theology. (Theology and Life Series 21) (1987) Liturgical Press, 1990. ISBN 978-0814656167. Di Berardino, Angelo. Encyclopedia of the Early Church. Oxford University Press, USA, 1992. ISBN 978-0195208924. Donaldson, James, Alexander Roberts, Philip Schaff, and Henry Wace, Eds. Ante-Nicene Fathers. Hendrickson Publishers, 1994. ISBN 978-1565630826. De Jonge, H. J., "The New Testament Canon," in The Biblical Canons, eds. de Jonge & J. M. Auwers. Leuven University Press, 2003. Ferguson, Everett, ed. Encyclopedia of Early Christianity. (Garland Reference Library of the Humanities) Routledge, 1990. ISBN 978-0815333197. Freedman, David Noel. Anchor Bible Dictionary. Bantam Doubleday Dell Publishing Group, Inc., 1992. ISBN 978-0385425834. Fox, Robin Lane. The Unauthorized Version: Truth and Fiction in the Bible. New York: Vintage, 1993. ISBN 0679744061. Gamble, Harry Y. New Testament Canon: Its Making and Meaning. Wipf & Stock Publishers, 2002. ISBN 1579109098. Hennecke, Edgar, and Wilhelm Schneemelcher, eds. New Testament Apcrypha. Vols 1 and 2. The Westminster Press, 1964. Jurgens, William A. Faith of the Early Fathers. (3 vol set) (1980) ISBN . Lightfoot, J.B. ed., transl., J.R. Harmer, translator, and Michael W. Holmes, ed. Apostolic Fathers: Greek Texts and English Translations of Their Writings, 2nd ed. Baker Publishing Group, 1992. ISBN 978-0801056765. Lindberg, Carter. A Brief History of Christianity. Blackwell Publishing, 2006. ISBN 1405110783. McDonald, Lee Martin, and James A. Sanders, Eds. The Canon Debate. Peabody, MA: Hendrickson Publishers, 2002. ISBN 1565635175. Metzger, Bruce A. Canon of the New Testament: Its Origin, Development, and Significance. Oxford University Press, USA, 1987. ISBN 978-0198261803. Noll, Mark A. Turning Points. Grand Rap;ids, MI: Baker Academic, 1997. ISBN 978-0801062117. Sundberg, Albert C., Jr. The Old Testament of the Early Church. Cambridge, MA: Harvard Univ. Press, 1964. Ulrich, Eugene, "The Notion and Definition of Canon," 21-35, in The Canon Debate, edited by Lee Martin McDonald and James A. Sanders. Hendrickson Publishers, 2002. ISBN 1565635175. VanderKam, James C., "Questions of Canon through the Dead Sea Scrolls," 94, in The Canon Debate, McDonald & Sanders, (eds), chapter 6: citing private communication with Emanuel Tov on "biblical manuscripts." "The Old Testament of the Early Church" Revisited, Albert C. Sundberg, Jr., 1997. This page was last modified on 7 June 2016, at 15:58.